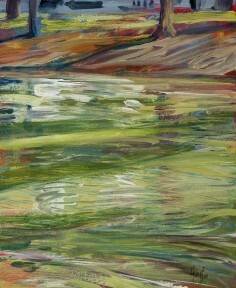 The Quicksilver Mine Co. presents a one-woman exhibition by Santa Rosa artist Louisa King Fraser beginning July 9th. 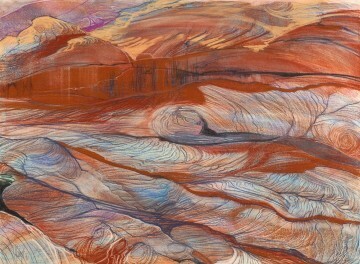 Titled Sojourns: Paintings and Drawings 1988—2010, this show continues through August 15th. Spanning over twenty years of travels throughout the US and around the world, this exhibition explores Fraser’s artistic interpretation of place as both an abstract expressionist and a realist, as a studio painter, or working au plein air. "During the past twenty years, a good day of painting outdoors has produced work that reflects both abstraction and realism," says the artist. "Standing very close to a finished painting, it may appear more like an abstract jumble of color; from a distance, the entire picture becomes more recognizable." 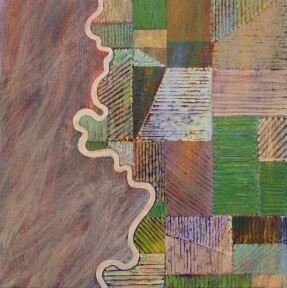 During the early 90's, Fraser also began a deliberate series of studio paintings that she calls "Earthvisions", originally inspired by the grid work of suburban tract housing on the East Coast seen from a single engine Cessna as she flew with her husband from Virginia to upstate New York. Pursuing images springing from this kind of bird's eye view she says, "I express my elated or sobered reaction, my awe and fascination with clouds, land and earth and water below" through this ongoing and much more time consuming body of work. This process begins with on (or above!) site sketches which then evolve into paintings and drawings in her studio in Santa Rosa. 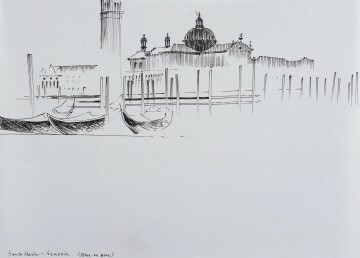 An Artist Reception for Louisa Fraser will be held on Saturday, July 10th from 4—6pm. Fraser will also be present in the gallery to talk about her work and travels on Thursday evening, August 5th beginning at 7pm. 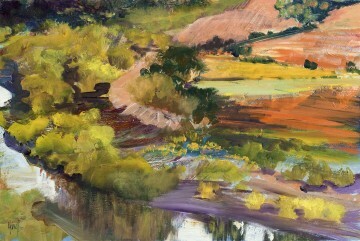 Louisa King Fraser received a BFA from Stanford University in 1962; more recently she studied with the Hermitage Group in St. Petersburg, Russia. 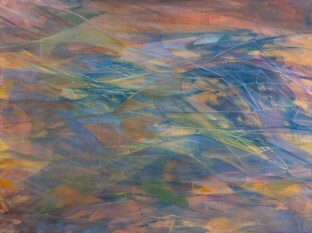 Selected solo exhibitions include the Bradford Gallery in San Francisco, the Press House Gallery, Sonoma, and Santa Rosa's Sonoma County Museum. She has also participated in numerous juried group exhibitions including the Sebastopol Center for the Arts, the (former) Museum of Contemporary Art and the Arts Council Gallery, both in Santa Rosa.